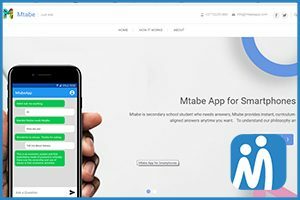 Mtabe is a start-up using artificial intelligence and SMS technology to deliver learning content to students in Tanzania who cannot afford textbooks and have no Internet access. It is so simple that an average African student needs no new device to get started. Mtabe’s goal is to help young people transform their lives through education, using technology to make learning easier, quicker and more efficient. Secondary school students aged 13-22 simply send their questions via the messaging area of their phone to Mtabe and receive the answer in a few seconds. The Mtabe team of educators, developers, entrepreneurs and experts covers all aspects of learning, providing instant, curriculum-aligned learning content to students via SMS, so that a young person in a place without light or internet can still learn. Partnering with the Institute of Education, the project ensures that content is of top quality and designed for inclusion. Mtabe is driven by high social impact, as well as a sustainable business concept.